Offering you a complete choice of products which include Solar Cooking, Solar Lighting, Solar Photovoltaic Power, Solar Steam Generation, Solar Cooling & Refrigeration and Wind Power. 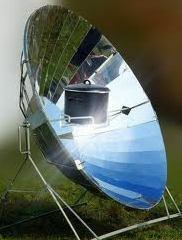 Solar cooking is one of the most economical way of cooking food. Frying, boiling and heating are all possible with solar cooking systems. Different configurations, designs and sizes are available, also the material of construction differs from system to system. Nevertheless the systems are reliable. Payback period varies from a mere six months for smaller systems to four years for larger ones. We market quality products that last long and are efficient. Solar lighting is most appropriate for rural areas where electric distribution is unavailable. But it is also being increasingly adopted in urban areas because of dropping costs. Solar lighting needs a power backup system in the form of battery storage in order to operate at night. Different configurations, designs and sizes are available, also the material of construction differs from type to type. These are long lasting and have payback period from a one year for smaller systems to six years for larger ones. We provide quality products that last long and are efficient. Solar photovoltaic power systems incorporate large number of solar modules into arrays. Each array configuration determines the voltage and current ratings. Combination of such arrays finally decide the power output. But the output itself may not match with the required specifications, hence inverters and regulators may be necessary. Also battery banks would be required for storage purposes. The payback periods Solar photovoltaic power systems ranges from six years for smaller systems to twelve years for larger ones with backup. The life of system will be around 20-25 years. Both roof-top and ground-mounted configurations are possible. Systems are available ranging from a fraction of a kilowatt to several hundred kilowatt. Lot of industries use steam for process applications. Besides, steam can also be utilised by communities for cooking, etc. So for any direct application of steam, solar steam generation should be considered for economical reasons. Because of higher thermal efficiencies the payback periods for solar steam generation are very tempting, and ranges from two years for smaller systems to five years for larger ones. The life of system will be around 15 - 20 years. Conventional systems make use of glass coated with silver or aluminum as reflectors. Concentrated Solar power (CSP), Fresnel Type and Tower type designs are usually implemented in power projects. We offer latest Solar CSP technology which incorporates solar reflector films, aluminum supporting materials and evacuated glass receivers. Solar cooling or refrigeration is possible either by harnessing solar photovoltiac power or by direct application of steam as in absorption refrigeration. Absorption refrigeration is the normal practice as steam can directly be utilised for cooling process. The payback periods are promising too, while the life of system will be around 15 - 20 years. We have absorption based refrigeration systems with high efficiencies and quick returns. Wind power is a clean, renewable source of energy which produces no greenhouse gas emissions or waste products. Wind power is feasible at locations where high wind speeds are recorded. Higher the wind speed higher the output power that can be obtained and faster the payback period. Wind power systems however have one disadvantage if they are installed in the vicinity of settlements. They create disturbance through noise and, hence the ideal locations are mountain tops and sea coasts. We offer systems that are light weight, more efficient and produce low noise.